Perhaps some of us can start using the slogan on our own and see if it catches on? That picture of the illuminated sign is wonderful, and deserves wider distribution. Sure - maybe we can start plastering them over the star. If you think of somewhere you want to post it, just take the picture and credit to Durham County Library. It's always so heartbreaking to scroll down and see the "now" picture, but the last couple of days especially so! Thanks for your continued great work on this site. "Old-timers can sing you the jingle from the 1970s featuring the slogan, "Durham's got it." Soon after it came out, the story goes, the city was ranked first in the nation in syphilis and the slogan quickly faded. (It's just a coincidence, I think, that the most recent slogan is, "City of Medicine.")" "Durham: Renowned the World Around" is about as unique or identifiable as "Where Great Things Happen," with the exception that it's got history here. And while I love the story of the sign, I think if it still existed, I might be advocating ripping it down, or at least putting it in a museum instead of letting it continue to blare with 1200 bulbs such banalities as "Progress" and "Success." Wasn't "progress" the driving idea behind urban renewal? Honestly, I think the legacy of this sign has found a perfect resting place -- as a painted mural on the side of Southpoint. Let us all remember it as part of our history, but stick it out in the 'burbs where I don't have to look at the damn thing. I think that sign is incredible. It looks like something you would see in NY or Chicago (like the Wrigley Field sign), never in a "small" southern city. Too bad it is gone. Maybe the remnants are sitting in somebody's basement or crawl space and could be resurrected. I think recreating it anew would be somewhat disingenuous though. I still can't believe that taxpayer money was used to pay a consultant to come up with "Durham, Where Great Things Happen." 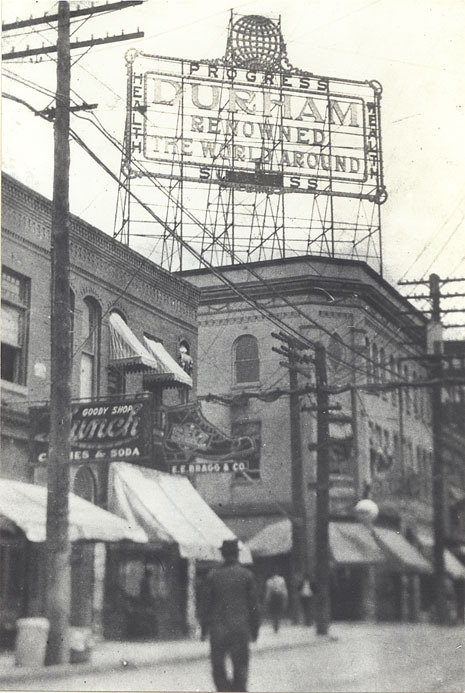 I like the idea of a contest like they did for the sign back in 1913, or maybe just let Flywheel or one of our other creative groups design something. I think that consultant got something like $40K or $60K for that slogan and logo design. And what did we get? More cheese - bursting stars. That building you profiled was awesome. Had never seen it before. Another shame. To halfway agree with Michael, I think the slogan is as banal as anything else that has been produced as a slogan. I would as soon have this as a slogan as anything that has come since - 6, 1/2 dozen... I do think it is sort of quaint wording - kind of like flowery late 1800s-early 20th century newspaper prose - that makes it amusing. I can enjoy it on that level. Frankly, I think a city that feels it needs a slogan has a deeper problem than whether it is banal or catchy. I do think, historically, though, it is an interesting expression of Durham's early 20th century hubris as an industrial dynamo. I disagree about the sign itself, though, and agree with the comment of "anonymous" - I think it is the kind of sign that can become iconic with longevity, even if you don't take the slogan seriously, or view it solely as part of its own historical context. Actually, a quick google of "Renowned the World Around" only turns up a coouple of dozen hits, about half of them related to Durham, a couple related to Dell ink cartridges, and one or two to titleis golf balls. "Where great things happen" is also used by Singapore, Victory Life Church in Hampton VA, Spring Mill Bible Camp in Indiana, Palouse Empire Gymnastics in Moscow, Idaho, The Circle-T Girl Scouts, the Arizona Biltmore, and a host of others. I also like the historical resonance and slightly archaic feel of both the word "renowned" and the construction of the sentence itself, not to mention the rhyme. As for the sign, although i never suggested bringing its physical maifestation back, i rather imagine that a contemporary version using LED technology could overcome the excessive energy use. I can think of several places where its placement could become as iconic as the old Silvercup Bakery sign, that greeted you as you entered Queens from Manhattan. I'm still not sure that I miss having a big glowing sign in the sky, given how much I like stars and like cities that contain their light pollution. But it occured to me today that Gary's image of the sign at night, the white dots on black, would make a hell of a bumper sticker. Hey, Gary, would you object to a little Cafe Press action? I think it would be really cool on a black T-shirt. But it isn't mine to give - we'd need to contact Lynn at the DCL to see if there is a copyright issue. Durham's Got It has made a return. 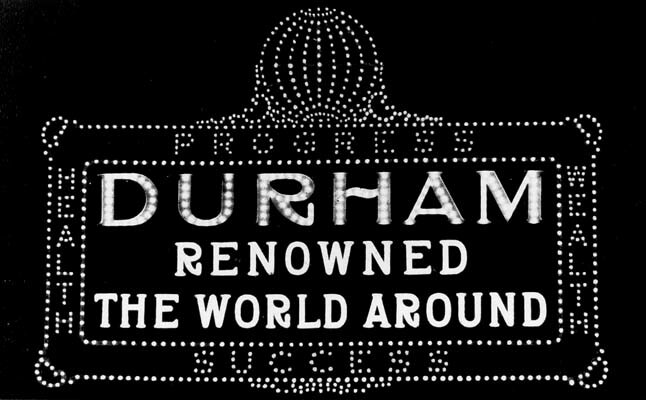 It's fun to see six years later that "Durham: Renowned the World Around" has made such a noticeable comeback. I love the design and the slogan and am pleased to see it spread around as often as I do. 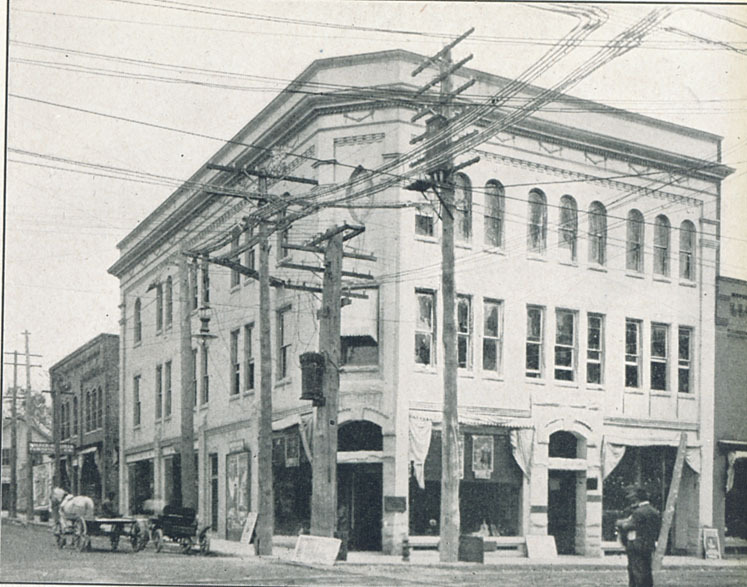 The building on the northeast corner of East Main St. and Church St. was built between 1898 and 1905. While it isn't clear if the building was built to house the local telephone exchange, by 1905, it contained the Herndon drugstore on the ground floor and the telephone exchange on the upper floors. It is referred to in the city directories as the "Loughlin Building" with rooms upstairs in 1903; notably, architect Hill C. Linthicum roomed upstairs at 201 1/2 East Main in 1903-1904. 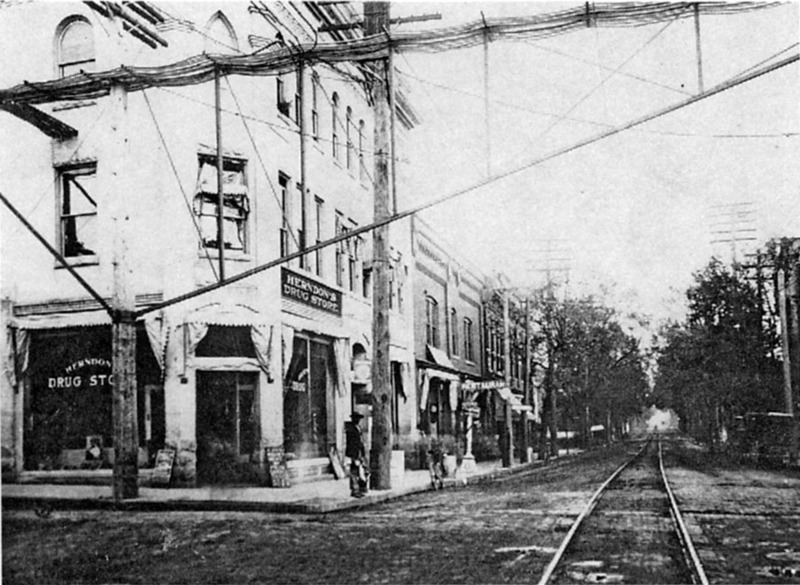 Two telephone exchanges were established in Durham during the late 1800s - a local telephone company, and the Bell Telephone Co., which were in direct competition with one another. Julian Carr, LA Carr, and George W. Watts held a controlling interest in the Interstate Telephone and Telegraph Co., which had been established in Maryland. They purchased the Durham exchange (and its 20 households) and continued the competition with Bell. By 1903, Bell had closed their local exchange, although they continued to provide long-distance service. Northeast corner of Church and East Main, looking east-northeast, ~1910. Note on both above pictures the large bundle of telephone wires entering the Church St. side of the building. By the 1940s, a hotel (likely called the Durham Hotel) was operating out of the upper floors, while the lower level was "L&M Lunch" (evidently a chain, since there was one at Morgan and Rigsbee as well. This building appears to have been demolished - or very heavily modified - by the mid-late 1950s. By the late 1960s / early 1970s, these buildings had been taken and demolished by Durham - Renowned the World Around for Tearing Buildings to the Ground - using urban renewal funds, along with the remainder of the block. To some extent, this entire block fell victim to the pipe dreams of an Oklahoma developer named - Barket, and the anxiousness of a city to do whatever it could to a attract a developer who promised a 40 story building to be constructed in downtown Durham on the block between E. Main, Church, N. Roxboro, and E. Parrish Sts. In 1978, the city built a new impervious courthouse on the block, designed by Archie Royal Davis, which looms, Death-Star-like, over the street. I don't know whether the design direction was "try to intimidate people into avoiding the courtroom," but that's the vibe it gives me. It's among my least favorite buildings in Durham. It seems that they tried their best to emulate Barket's Folly, but could only afford the first ~5 stories.